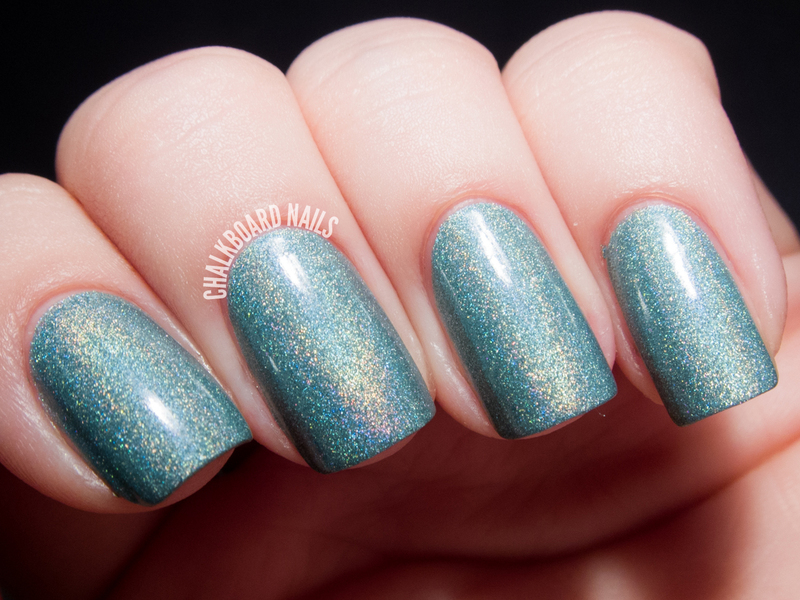 I've got some lovely indie swatches to share with you this afternoon! These shades are from Serum No. 5 and are all a part of the FW13 Collection. There are some other shades in this collection that won't be making an appearance in this post, but keep an eye out for those in the near future. Today I have three holos, two glitters, and one duochrome for your viewing pleasure. These photos were taken before I changed my nail shape, so let's all enjoy a bit of nostalgia for my squaries. A Cup of Teal is my favorite of the bunch. The color is really nice and the formula was easy, needing just two coats. Shown first in indirect light and then in direct light to show off the holo. Jaded is similar to A Cup of Teal in terms of holo-level and particle size. The color is a little more metallic/powdery, and has a pretty green tint to it. Two coats. Shown first in indirect light and second in direct light. 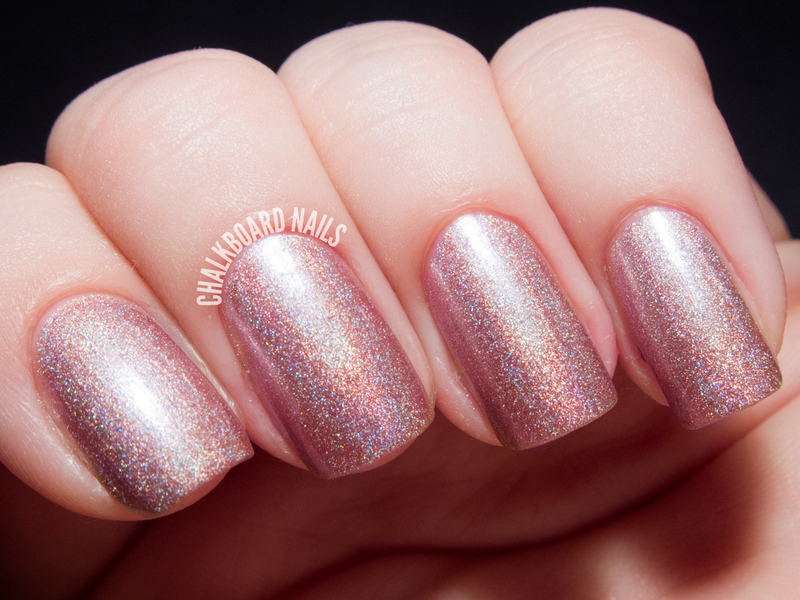 Rounding out the holos we have Mauvelous, a dusty pink holo. The formula was just like the other two, easy to use and opaque in two coats. Shown first in indirect light and second in direct light. Acai of Relief is another one of my favorites from this group. I thought this one was going to be super sheer but was pleasantly surprised. This is three thin coats, you may be able to get away with two (or one if you are layering over black). 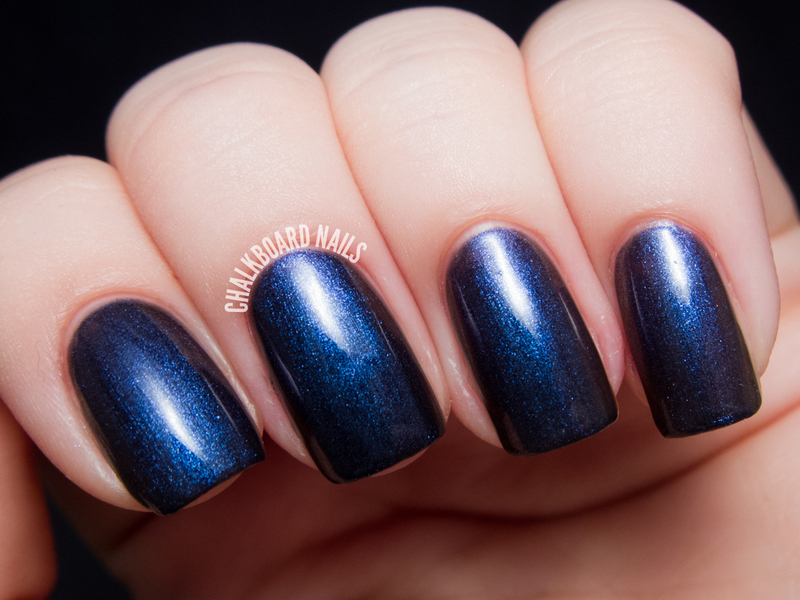 It has a glowy blue shimmer that shifts to purple when you angle your nails. Check out the second photo for the shifty goodness. 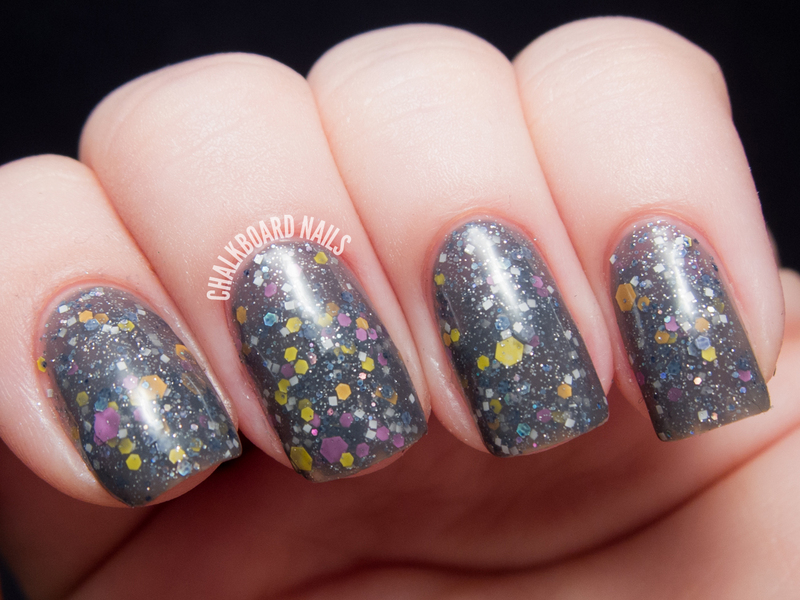 Best Witches is a grey based jelly shade with bunches o' glitter. The most prominent colors are purple, white, and yellow. The glitter can make it a little bumpy, so be sure to double up on topcoat for a smoother look. Three coats shown. 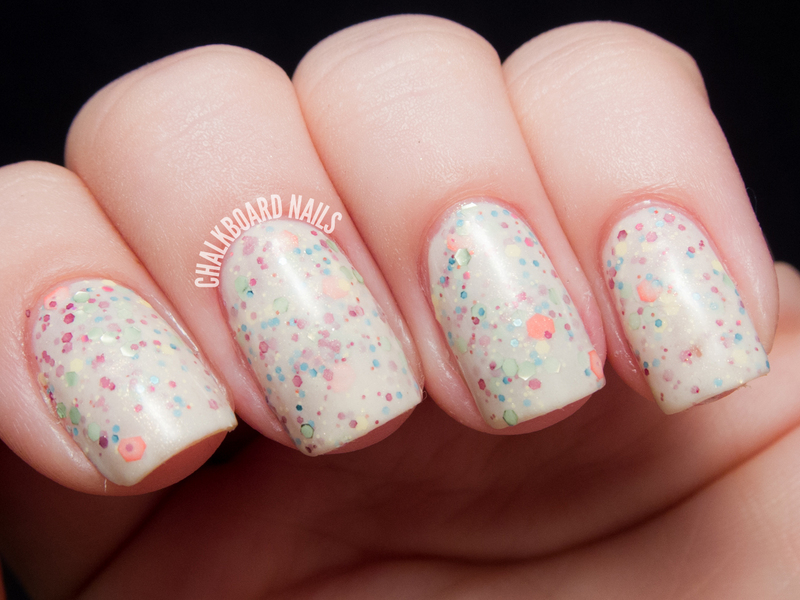 Second Spring is an ivory based semi-transparent creme shade with floral colored glitters. The base of this polish is on the more opaque side, so if you want the glitter to be more obvious, I suggest layering one coat of this over a matching creme. I used three coats for the coverage you see here. Like Best Witches, I recommend two coats of topcoat on Second Spring for a smooth look. What do you think? This is an older collection but the colors in it go perfectly with the fast approaching springtime! Some very stunning colors here! I really like the holos and Best Witches--very unique! Oh my goodness! I have to have Jaded! Gorgeous. I'm such a sucker for chunky glitter and confetti polishes. If only application wasn't a little tricky, and taking it off wasn't such a pain in the a**. My nails always suffer from it long term. I really, really, really like those holos! Amazing Colors! Love Acai of Relief , A Cup Of Teal and Mauvelous! A Cup of Teal and Acai of Relief are beautiful shades, and I love the names too!